… everything is wonderful. The sun is shining, the birds are singing, and my garden will be fabulous this year. That is how it feels every year at this time when I go to plan my garden. A new start. A fresh beginning. The world is my stage. I can do anything. Why does it then not always turn out that way? What are the things that will sabotage this new beginning, this new plan? Here are a few that I have done in the past that lead to more trouble than they were worth. Forgetting what stage of life you are in – you can’t do everything all time time. If you are like me, though, you may think this doesn’t necessarily apply to you. But it does. Just remember, it will be okay. There will always be next year or next month or the next produce crop. If you are not able to put out a garden this year due to illness, a new baby, a death in the family, a move, or other time obligations, it will be okay. The world will keep on going and perhaps next year you will be able to put out that perfect garden. Or maybe it just means it will be on a small scale or a fall garden instead. Take a deep breath and try to look at the positives. What can you do with what you have been given? Remembering that there will come a time where you have to maintain – my favorite time in gardening is in the spring when I am putting new seeds in the ground. My least favorite? When it is July, hot, nothing is producing yet, and I have to weed and weed and weed. (Well, I used to have to weed, but that has lessened with a square foot garden. Now I rarely have to week, and even then it is usually just a handful of them.) There are still things that need to be done to maintain the garden, such as watering, removing plants that have disease, pinching off excess limbs on my tomato plants or fighting a pest. Does this time happen to fall in the middle of something else going on? Is it reasonable to assume that you will be able to maintain what you started months before? How long will this task take and how often? Forgetting to continue through the finish line – so often I find myself starting but not finishing a project. That could mean starting my seeds but not following through on putting them where they will get enough sun once they reach almost transplant size. I need to stay focused on what needs to be done next. Which leads to the next point. Becoming a SHE – a Sidetracked Home Executive. “I’ll go water the garden now before I have to go run this other errand. Oh, but I also need to take out the trash. Wow, the can sure could use a cleaning. I’ll just do that really quick outside. Hmmm, the garden hose has a hole in it. Now where is that duct tape? If this shelf was neater I could find the tape better. I’ll just do that real quick. Now how did that get here? It is supposed to go in the house. I should take it there before I forget.” After which you completely forget about the watering till you are laying in bed and it is 10 PM, so you just pray for rain. Sound familiar? Loosing track of your priorities – gardening is not more important than feeding your family (see #7), though in some cases it may be important so that your family can eat. In that case, you will need to find a balance. Trying to do too many new things at once – I know there are those of you who can do this, but not me. Moving to a new zone (I have done this two or three times), trying a new style of gardening, and starting a new job all at the same time quickly became a recipe for disaster. Not being realistic about your time – there was one year where we had moved to a new area. My yard was small, but there was room enough if I had been honest with myself. Instead I took the opportunity to have a plot in a community garden – 20 minutes from my house in a direction I never went. How much time really does it take to have a small garden? Turns out the plot was huge and had not been worked for a year or two. This meant the weeds were prolific and the soil hard. To make it even better, we were in the middle of a drought. So, after work a few evenings a week I would go to the garden. However, not only was there a 40 round trip drive involved, but I also had to actually do something there. That “quick trip to the garden” easily turned into 2 hours there plus driving. By the time I got home I was exhausted, supper had not been made, and my husband was feeling neglected. This also meant that my grocery shopping had to be done over my lunch hour instead of after work. If I had taken a step back and added up the time, I would have quickly seen that this endeavor was going to take a lot of time and effort for little return. There were a few good things come from this experience. That year was the first time I had grown watermelons, among corn no less. Otherwise known as “the part of the garden I didn’t know what to do with but wanted to keep down weeds”. The watermelons turned out. The corn didn’t. Not looking beyond your perceptions – yes, it would be great to eat only items you have grown and put up. The reality, for me, is that I don’t really like my canned pickles. It is just not something I seem to be good at. Yet. We do not eat many pickles, honestly, so spending the time and effort to put up a lot is a waste. It is better for me to buy the 1 or 2 jars a year from the store. Now, we do love raw cucumbers, so I do make sure to have several plants around the garden. Garden? What garden? – this tends to happen to me when the garden has not required a lot of my time so I have not been as attentive to it as I should be. Suddenly, a crop comes on or weather changes and watering needs to be done. Often I don’t remember to go check on it till my friend mentions her garden and reminds me that I need to actually visit mine in the backyard. Not stopping to do your research – if moving from Zone 6 to Zone 9, do follow what the extension service says is the planting time. They really do know what they are talking about. Just because you planted tomatoes in April in the other zone, does not mean that it is a typo when they say to plant tomatoes in February. There is a reason. Think July and August. Plants do not produce a lot when they are being fried to a crisp. Every year brings new adventures, new opportunities, and new ways to view the garden. I am sure that at some point I will repeat one, if not all, of the previously mentioned actions to some degree. Part of it is my personality, part of it is that life happens and we can’t always plan for it. However, if I was not optimistic about gardening I do not think I would have the courage to do it year after year. With that in mind …. … this year WILL be different. My garden will be fabulous, the birds will continue to sing, and I will have more produce than I know what to do with. How about you? Any grand hopes for your garden this year? Do you ever find yourself doing the things mentioned above, whether in your garden or in life in general? Are there any things you do to avoid these pitfalls? I tend to suffer from the opposite of SHE. I get so immersed in my online business that I forget (ignore) everything else. That isn’t good either. I’ve been trying to be more conscious about it. So far, so good. My husband and I have wanted to start a garden and we have never done it. We have even picked out the perfect spot in our yard and talked about what we can do to prevent any “interested guests” from testing the quality of our garden, but still have not taken the proactive steps to start, let alone maintain the garden. This post has inspired me and I really want to add this into my life. Whenever I have been faced with a challenge I find it easiest to take that challenge down to manageable pieces. My husband and I are envisioning the big garden, but if we start with a small herb garden and learn more about gardening then before we know it we will work our way up to the big garden of our dreams! Jaime, I think starting small is a great idea. This would also give you the opportunity to try a few different things. Some find that using hair clippings (from the salon or such) around the edge helps. Others that I know of have to take more of involved actions. Personally, I have used a cover make up of chicken wire on as wooden frame to cover the majority of my garden. You can see a description of it in “Square Foot Gardening”. This doesn’t work so well for a large garden, but does well for a smaller ones. I have planted several plants outside of this protection and they actually did better than I thought. The rabbits didn’t bother the herbs. Now, rabbits are about the largest thing I have to be worried about. If you have deer or such, well, perhaps someone else will have an idea. I have heard about fencing in whole gardens, even the use of electric fencing. Good luck on starting a small herb garden. This was my first year trying it and I’m not sure why I didn’t do it before. We do square foot gardening at our house. I am a little behind this year, we have had so much rain the peas are going to have to wait a while. Your post has inspired me to get my seeds together to start my warm weather crops indoors. My kids will love it and we have a grow lamp to put them under until we can get them into the garden. I also need to get my supports for my crop cover ready so I can direct plant a few warm weather items under it once they have been started inside. I also hate the heat of August here. Eshelle, I used to feel this way too. Finally I found a few plants kept growing no matter what I did to them. This is also a reason I like perennials. Once you plant them it is hard to kill them. We just purchased our own home a few months ago and I in a hurry to start a garden. I need to start planning out what I want to do it has been a few years since we had home grown veggies. Have I mentioned how much I love cactus’s? Kelley, love your outlook. Thanks for the chuckle. Somehow, cacti are one of the few plants I have totally been unable to grow. Go figure. I would love to have a garden, but we have zero tree coverage in our yard (I even bought 2 “fast” growing trees that are very slow) and the watering in Florida heat makes it next to impossible. Deedra, I’m not very knowledgable about Florida, but I do think the soils there would make it difficult. The heat definantly does not help. If you want a bit more guidance on a good tree to select and perhaps help figuring out how to best plant it, consider talking to your local Urban Forester, if there is one. Or the local Extension office if you are not in town. They are both good resources. Good luck. We started a square foot garden last year and it really made the whole process a lot easier for my linear mind to handle. Our lettuce and swiss chard grew in abundance, but everything else died so we will keep persevering this year! I think if I did try to have a garden it would end up “garden, what garden?” I always have way too many things on my plate so anything that absolutely requires my attention or it would wilt and die is probably not a good thing for me to be doing! Maybe once I get my own place and am settled down a bit! Our little plot of land doesn’t get enough sun to grow a garden, usually. We did take out a big maple tree last year, though, so maybe things will be different this year. I’m not a gardener. But I took your post as a metaphor for life and learned something useful from it! Thank you for sharing. I know what you mean. I have moved to another zone and still tryin to figure out times to plant. I’m more of an animal person than a green person, but I planted some tomatoes and courgettes a couple of years and I totally enjoyed eating them through the summer. Funny how your “gardening” lessons also apply to real life! I have no plans for the garden except to pick some lovely annuals come June that will survive in my new west-facing house. Spring comes soooo late here that I hope I can wait! I’m ready to garden! I too get all excited when it’s planting then I hate weeding. I used to have a garden and I miss it so much. But in this post I could relate as I see myself doing a lot of this especially where I start todo one thing but get sidetracked and forget about the first thing I was going to do. Every year I make big plans for our garden, and each year I succeed in growing a little more! I fall into all the pitfalls, lots of my plants don’t make it, but little by little I’m getting there so I’ll continue trying! good article about priorities and stuff…. I’m a gardening optimist even though I don’t even have a garden. There goes, #1 as in this life stage, we live in an apartment and are hence, sans garden. I also live in Sweden where the sun doesn’t shine for 11 months of the year, so there goes #2, nothing can be maintained without a bit of sun factor. EVERY year I start a herb garden on the balcony, there goes #3, I never follow through and forget about it until I stand there wondering why oh why isn’t anything growing? I get side tracked by everything so that’s it for #4. I feel like fresh fragrant herbs should be my priority but opps sorry #5. I am a new gardener as I never learn from the year before that’s if for 10.9 + 6! I think this post can definitely apply to any part of life. I get sidetracked really easily and run off on various tangents. I really need to remind myself to focus on one thing at a time. While I may not forget to water the garden that I can’t seem to ever get started on (mostly because I’m a horrible plant murderess), I do end up forgetting to do whatever other task was first on my list that day. We are going to try raised beds for our garden this year. And I agree with Corinne, a good metaphor for life. I know you were talking about your gardening in this post, but I kept thinking how much it so applies to our lives in general. I’m not into gardening, but I need to remember many of these things for my everyday life. I don’t garden, but my mother always did. And sometimes it turned out well, sometimes it didn’t. But it was always good, because she enjoyed the process more than anything. It was her form of relaxation. I think this post applies to most any hobby, not just gardening. Very informative and interesting. Thank you! Gardening is my thing, love it, love it, love it. Got my seeds together already. Gardening gives me peace and I love end when I can feed someone else. Great post and happy gardening! I’m hoping to at least plant some flowers in some pots this spring…thanks for sharing! I would love to have a garden, but I just don’t have the patience to keep it up. I can’t even keep basic potted plans alive, but I really loved your post! I really want to do my first garden this year! I think it would be wonderful to grow our own food…not I just need to learn how to do it! We started gardening a few years ago. Our first garden was one large plot that required a lot of daily work. The weeds eventually took over but we still had a nice harvest. Since then we’ve built 4×4′ garden boxes (minimal weeding!) and also transformed the area around our deck into a garden patch. This year we’ll add a few more areas for additional growing space. Our method of adding a little each year is working for us. We’re not feeling nearly as overwhelmed as we did that first year! I remember the first time I read what a SHE was! I agree ~ remembering what stage of life you are in is key ~ and hard to do! I have to be careful when planning my garden to not try to do too much because I will get overwhelmed and then I don’t get anything done. My Grandpa in the last years of his life grew Swiss Chard and that was it. He grew a lot of it and I would stop by and get a big brown grocery store bag full to take home. I have to agree with Corrine, she took the words right out of my head! As someone who does not have a garden, this can be used in a lot of aspects of life! My husband and I love to dream of everything we would like to grow at some point in time. It can get rather crazy, especially when we are looking at seed books! However, there are standards that we have come to expect every summer- tomatoes, green beans, zucchini, and cucumbers. After eating a few fresh from the garden cukes and tomatoes- all that effort is definitely worth while. My favorite time in the garden is late July/early August when I can take a couple of baskets out in the morning and gather a bunch of stuff to eat and can. That is the time when most of the weeding is done too. I also hate weeding. Our bad weeding time is usually in June- when the plants are tiny and the weeds are trying to take over. It takes a lot of patience and slow work to just get the weeds and not everything. I hope you have a great growing season this year. I get side tracked pretty easy. There are just some many things i need to do and not enough time. It’s my first spring. I am so excited of the plants budding and soon bear flowers. You know I’m from Philippines, where we enjoy flowers all year round. I think loosing my focus is my number 1 problem. Like now I have many paid tasks to do but I also have responsibility in giving comments since I participated in this Blogelina 100 comments event. I tend to shift from one task to another and the result is that I wasted so much time and not achieving my goal. I like the first bit of advice. I forget what stage of life I’m in and forget to enjoy it. I just want my tomatoes to turn out this year. Had a rough year with them last year. Dianna, me too. My tomatoes did wonderful at being green but once they turned red, forget it. I think I will try planting them in a different location. Well, except for the cherry/grape tomatoes. They did wonderful in those locations. I’m not a gardener but I also struggle with distraction and impatience. I suppose we all do, but thank you for the reminder to let life go at it’s own pace. I enjoy having produce from the garden but am afraid I neglect it terribly. I have high hopes this season with a smaller out of house workload. Can you re-send me this post in July LOL! Trying to do too many new things at once – that is my pitfall. I started a rock/flower garden and it’s a work in progress. Since we’ve been in our house for only 3 years, I have to give myself some credit for taking my time adding to it season after season and not feeling bad that its not perfect yet. I’m always doing more than I have time for, and its ok that its a work in progress. We’re going to have our first family garden this year. I’d love to hear more about the square foot gardening… Maybe I can talk my fiance into that instead of the giant patch he’s planning on tilling. I’m hoping to plant a garden this spring. We’re just getting to the time of year (where we live) where I can start putting some seeds in the ground. I do have some high aspirations for my garden . . . but we’ll see. We just purchased our home last summer and I didnt have time to put in a garden. It is on the list for this Spring. Going to try something new. Box gardening. I used to make great gardens, hope I havent lost my touch. Thanks for sharing your talents. Have a great evening!! I am always trying to do too many new things at once! I have so many ideas and I just want to work on them all! Great reminders! I’m always trying to do too much…I forget that I can’t do everything that I want to with a 2 yo and 7 yo. Many years ago, we bought a house with several acres of land and I decided to have a big garden. I planted along with many other things, 50 tomato plants. It seemed like a good idea at the time. By summertime, I had so many tomatoes that I couldn’t keep up with taking them off the vines. I had tomatoes all over my kitchen, and had done so much canning that my shelves were overflowing. What did I learn? Three or four plants are enough. Really they are. Ha! I’d be happy to simply have a garden at all. I’m hoping to at least plant some lettuce in a container..
Great post! I can so relate to being unrealistic with my time, and having far too many things going on at once. Balance is always an issue over here. Thanks for sharing. We never had a garden growing up, so I know nothing about it. My mom says that she even kills the fake plants. My husband grew up always having a garden. So if we have a garden, my husband takes that responsibility. I’m thinking it’s probably not going to happen this year because he is going back to school. This is our second year in our home, so our second attempt at a garden. I learned quite a bit last year…like the spacing of plants does actually matter, and they really do need more sun then they got in that corner, lol. So we’ve got grand plans this year, but we also have a new baby coming very soon! So it might not turn out as big and grand as I would like. Eventually though we do want to be putting up most of our own produce, like salsa! I do get sidetracked sometimes, but because of that I keep a to-do list and that works really well, in general life. With respect to the garden, I often forget to tend to it, or when I want to do so it turns out it rains. It’s not a priority, but every time I’m out there, I enjoy it and tell myself to go back the next day. I get the opposite of SHE. By immersing myself in a project, everything else goes on the back burner. My children come to snap me out of my project to do the next thing. I have a black thumb when it comes to gardens. So I live through everyone else’s! I have always wanted to garden but am so intimidated by it. I have a great couple of books….but I put it off and put it off until I say “maybe next year.” I have friends who absolutely love having a garden! My mom’s gardens are amazing, but I do think she sometimes forgets that she is in her 60’s and cannot garden the way she used to. I’ve never been a gardener, though I’ve always wanted to try. I’m hoping to start with a small herb garden this year, and we’ll see where I go from there! 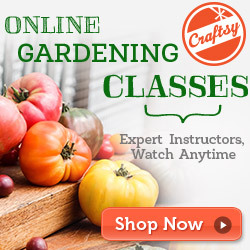 I would love to start a flower garden this year but not too sure what I should do. I would like to do a garden this year. We’d like to just plant tomatoes and zucchini though. I also would like to learn to can this summer. Thanks for posting this. I really enjoyed reading it. Those tips are great for me in more than this aspect of my life. I’m a big multi-tasker, so I try to slow things down and do one thing at a time. I notice when I do, things get done quicker and more effeciently. I have been using my phone timer, which seems to help also. I give myself a set amount of time to complete a task. Once the timer goes off, I have to stop. Great post. Thank you for sharing. Oh I can’t agree more. I’m a horrible gardener because of some of those points made… weed weed weed in the HOT HOT summer. I still continue summer after summer trying put in my hours of labor in the family garden though. Great post! So very true! I miss my garden so much. I had to move into an apartment this last fall but I’m looking for a community garden nearby to use. I’m also a SHE and your post just reminded me that I need to get back on the FLYLady programs stat. I am the master at distraction. Just like you stated above. My husband will ask if I made a phone call and I will tell him I meant to but didn’t. I got distracted one the way to the phone, lol. I hope have a small garden this year. I tried to do one last year, but I planted way too many seeds of different flowers and veggies in a small plot. The pumpkin vines pretty much choked up everything. I have been doing a bit of research for this coming year and now have a plan in place. I think I am going to stick to veggies and herbs. That seems like a safe start :). i want to start an organic garden so i can save some money on veggies and fruit but i dont know where to start. I am worried that the pesticides sprayed around the house by our landlord have compromised the soil. I have a lot to learn…. Jenivieve, I would have the soil tested if you are not sure. Another alternative would be either a raised bed or pots, both in which you can add your own soil mix. That way you will know what is going into it. The cost may be a bit higher on the start-up, but the following years you won’t have to make those investments. Oh my goodness! I have had the “SHE” problem ALL the time! Yes, I turned on the water and remembered it the NEXT MORNING! Oh goodness, my garden was sopping wet and so flooded. /sigh.